If you need to locate a specific Payment on the Payments Dashboard, you may do so by filtering through your Payments. This article will walk you through the various ways to filter your Payments. 1. Locate and select the Direct Pay tab on the far left-hand side of your screen. 2. 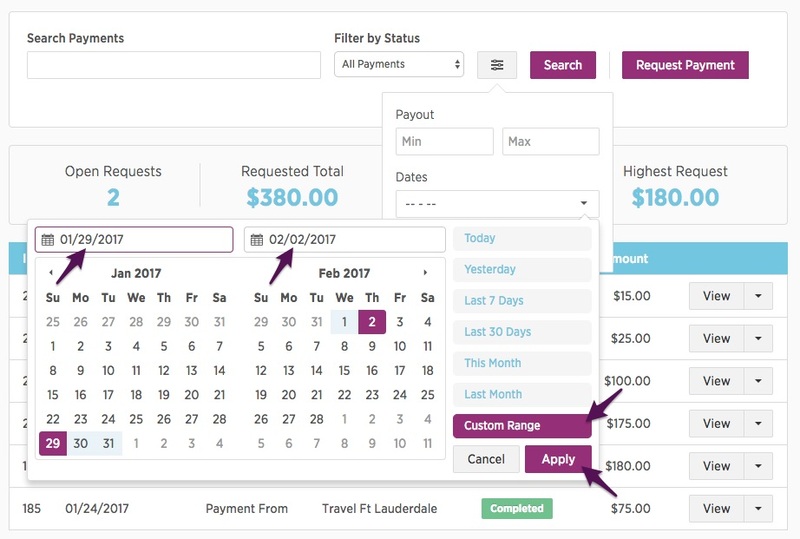 Once on the Payments Dashboard, you have the option to search and filter through all of your payments. You can search for your payments using each of the filtering tools separately, or you can refine your search by using all of the filtering tools together. You can search for a specific payment by either entering the Marketer Name or the Payment ID in the Search Payments box. Once you have entered your search criteria in the box, select Search. To search for your Payments by their Status, select the Payment Status type under the Filter by Status drop-down. When searching for your Payments by a set Minimum and Maximum amount, select the Menu button to the left of the Search button and set your Minimum and Maximum payment amounts. Once you have entered your search criteria, select Apply. To filter by a specific date range, select the Menu button to the left of the Search button. If you would like to set a custom date, select Custom Range and using the calendar icon select your date range. Once you have selected your date ranges, select Apply. Please note that the date range applies to the date you created your payment, not the Transaction Date.